I love describing my dynamic with cchris to anyone who has a moment to listen, because I never have been able to understand it. I even mention it on here as much as I can, partly because it’s part of my character makeup, and partly because I really am that bewildered by it. Over the years, things have shifted and changed. When I realized that he is very mysterious, my imagination occasionally will step in and try to figure out WHY. Who is so good at not giving out personal facts? For this many years? Is it villainy? Is it because there’s nothing there? Is it to appear more interesting? What is there to hide, and if there is nothing to hide — WHY. 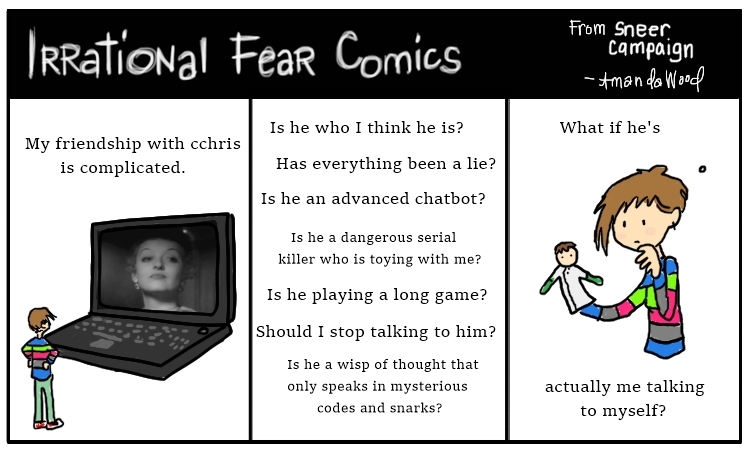 The irrational fear depicted in the comic has OMGJeremy to blame. Apparently he thinks that cchris and I write similarly, and maybe it is HIS irrational fear that I am pretending to be this whole other person. When he first told me of this, I did have a little while where I might have been horrified and fearful at the possibility. That would be world-shattering to realize. But I guess I don’t fear it, exactly. If it turns out it’s all been in my head, that’s almost impressive. I could live with it. I could live with having made a little Canadian Tulpa. That’s fine. Whatever. I would just like to know for sure before I die of old age.